Since it is not unlikely that I mention a day around here that is filled with snow. I must mention that I'm suffering through some absolutely beautiful days here. There is no more beautiful day - of weather - then the one where it was 40 degrees over night and reaches the grand high of 70 during the day. 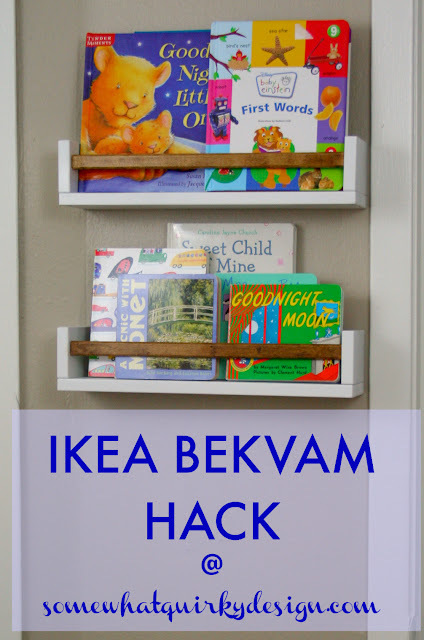 So what has that to do with Ikea hacks? So maybe we should get there. This is the IKEA BEKVAM. It's a cute little spice rack. Perfect for a small little kitchen. Like Ikea is famous for. When I got to good daughters place last month she had 4 of them that she wanted to "do something with" for the nursery. 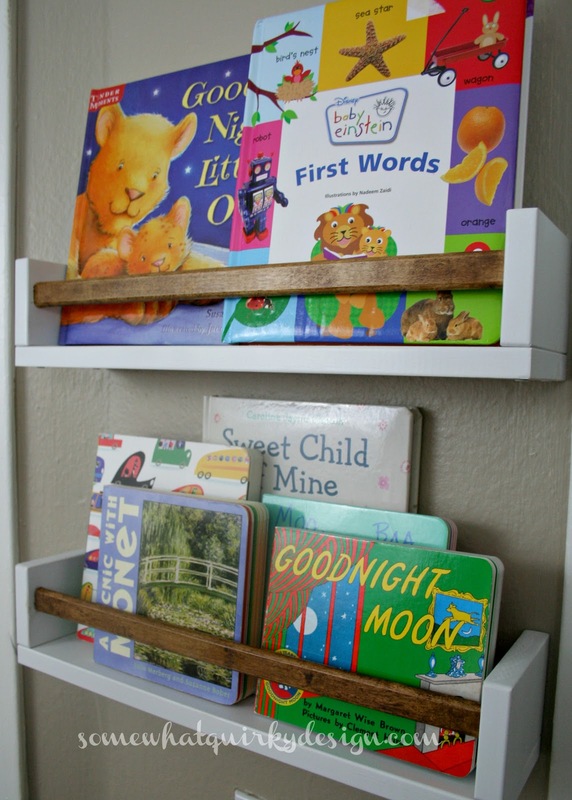 She had seen them used as book racks for children's rooms and wanted to do the same. But first they needed to be gussied up a bit. 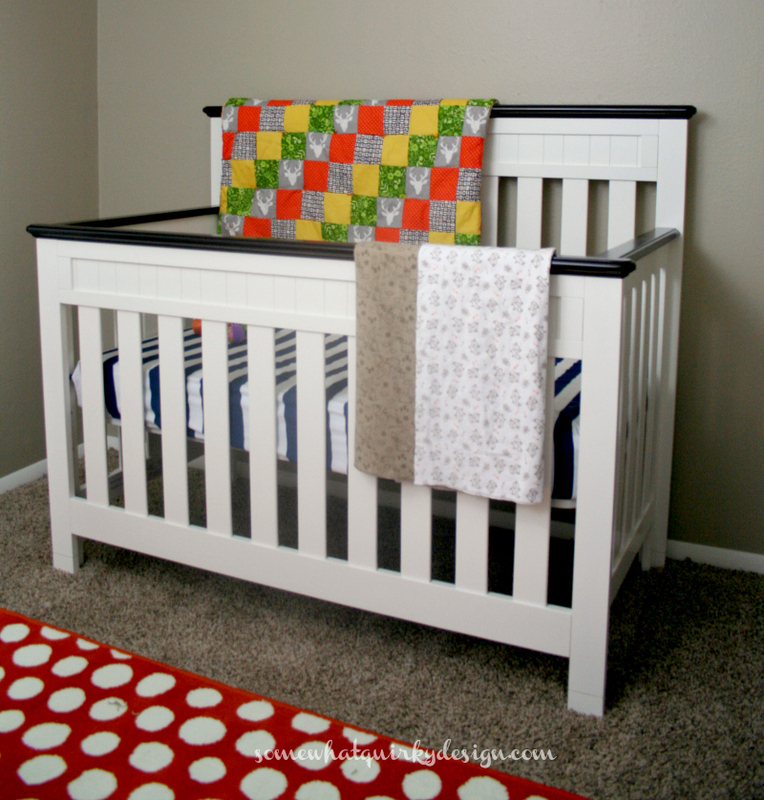 She wanted them to be white with a wood stain accent, to mimic the crib. By the way, these light/dark stripes on the crib can keep a baby fascinated for hours. Just staring. These shelves needed to be sanded so I did that. I covered the bar across the front with paper and tape and painted the rest with white paint from Rustoleum. (for which I would give you the direct link to but I can't find on their website) It was one of their enamel paints. I like the finish I get when I use these. Then I took off the tape and stained the bar with Dark Wax by Annie Sloan. There I go again - staining and waxing all in one step! If they aren't holding books they can hold other stuff, too. 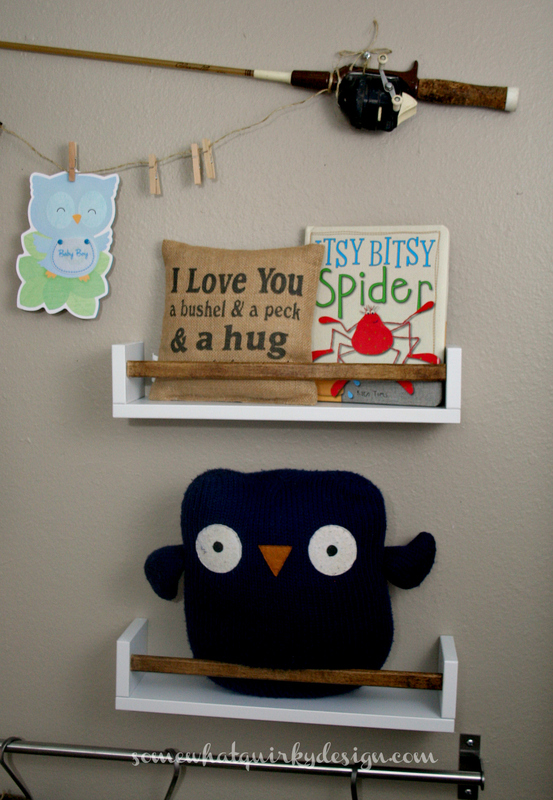 If this crochet owl gains any weight he won't fit anymore and he'll have to sit on the spool table! She also used the Ikea GRUNDTAL rail which is extremely versatile. I've got a couple of them myself in my kitchen. 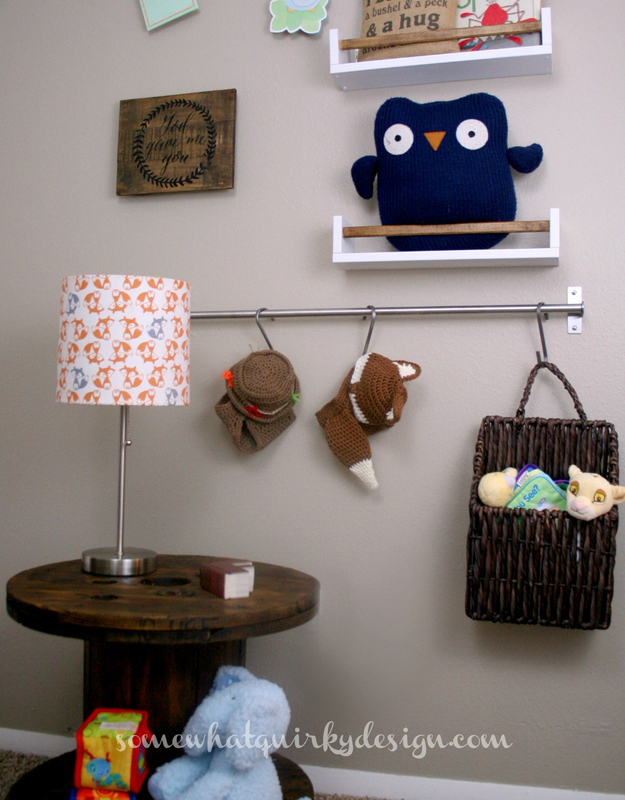 There's no better place to hang your fox tail pants! 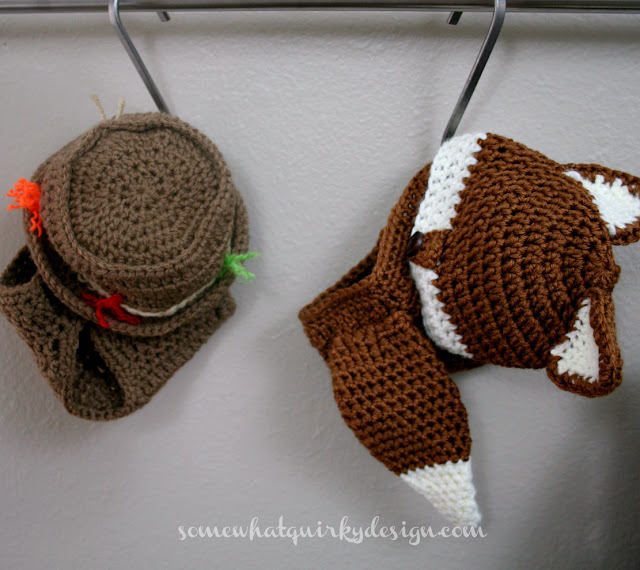 Because we all need a place to hang our fox tail pants! Where do you hang yours? I have never seen these spice racks - don't have an IKEA close enough to browse. If we go to IKEA Steve requires that it is a quick in and out for only what we went there to buy. Love your little racks, but why didn't I get some vicarious grandbaby love - no picture? I just love this idea! Looks like I need to make a trip to IKEA...great makeover! Way to "spice" up IKEA stuff! Creative use for the now transformed spice racks. However I am now quite depressed for I do not own any fox tail pants. Alas!